Bleeding disorders are due to altered ability of blood vessels, platelets, and coagulation factors to maintain haemostasis. 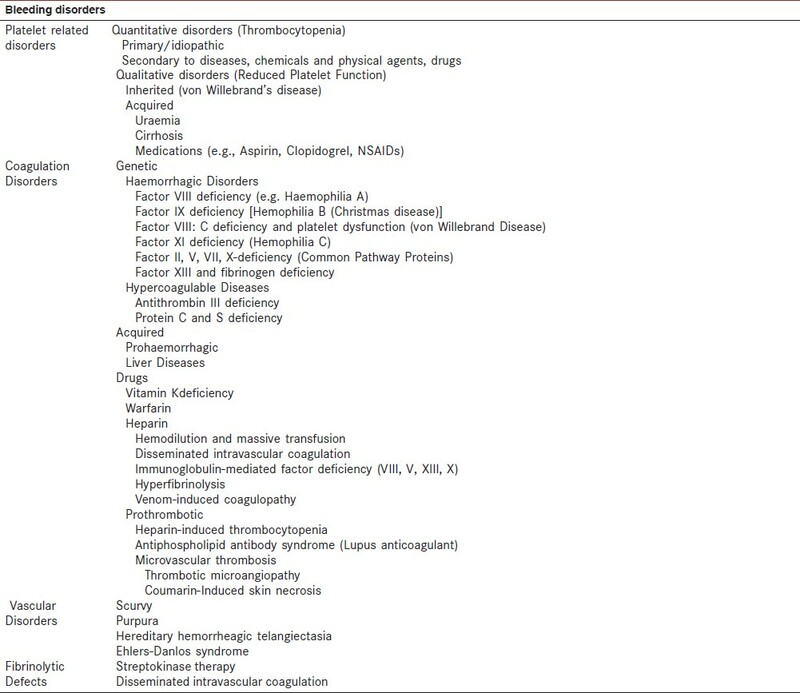 These may be inherited due to genetic transmission or acquired secondary to diseases affecting vascular wall integrity, platelets, and coagulation factors or due to drugs, radiation or chemotherapy. Most of the bleeding disorders are iatrogenic. The three phases of haemostasis for controlling bleeding are vascular, platelet and coagulation phases. 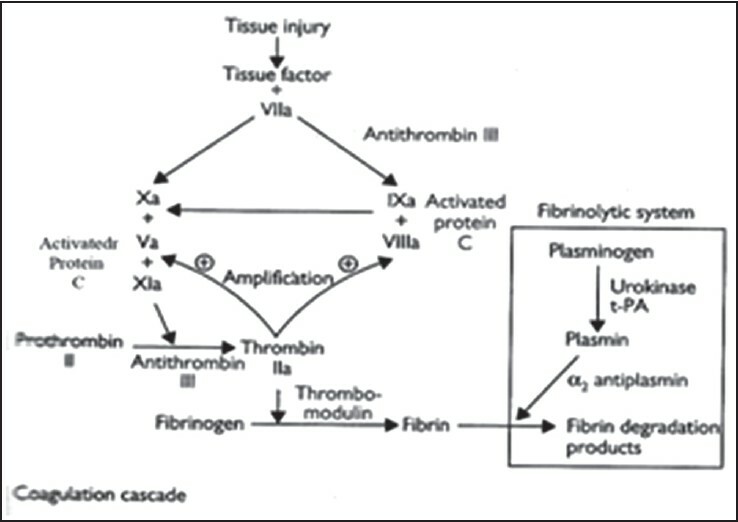 The coagulation phase is followed by fibrinolytic phase that dissolves the clot. Vasoconstriction of arteries and veins in the area of injury. Build-up of extra vascular pressure by blood lost from cut vessels. Platelets and vessel walls become sticky. 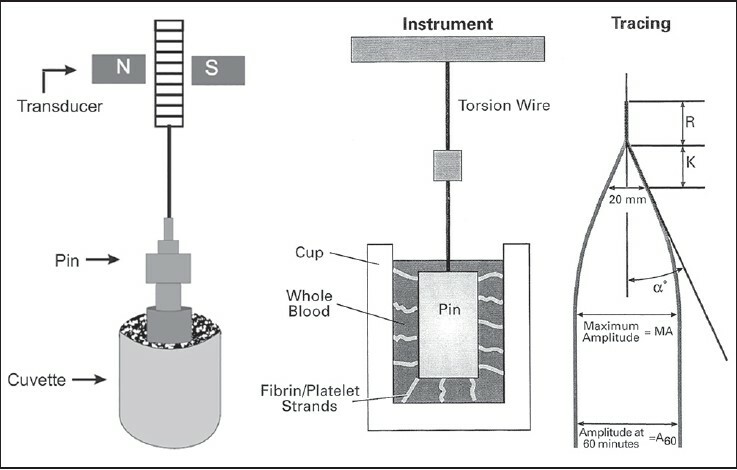 Mechanical plugs of platelets seal off openings of cut vessels. Blood lost into surrounding areas coagulates through extrinsic and common pathways. Blood in vessels in areas of injury coagulates through intrinsic and common pathways. Takes place more slowly than other phases. It is activated simultaneously with the coagulation and functions to maintain fluidity of blood during coagulation. It also serves in clot lysis once tissue repair begins. Spleen and liver destroy these anti-thrombotic agents. In vivo , there is a natural tendency for blood to clot. This is balanced by various naturally occurring anticoagulants. The most important of these is antithrombin III, which inhibits the activity of factors IX, X, XII as well as thrombin. This inhibition is greatly facilitated by heparin. 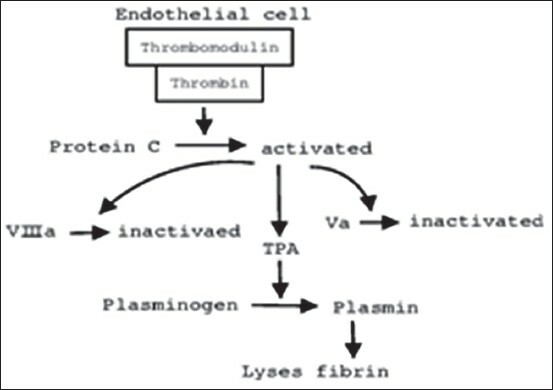 Coagulation is also inhibited by thrombomodulin, secreted by intact endothelial cells and binds thrombin. The thrombomodulin-thrombin complex then activates a proenzyme protein C, found in plasma, to its enzymatic form and this, together with co-factor, protein S, in plasma, results in inactivation of activated factors V and VIII. Bleeding problems after surgery, tooth extraction and trauma. Medications: Aspirin, anticoagulants, long term antibiotics. In the Ivy method [Figure 4], a blood pressure cuff is placed on the upper arm and inflated to 30 mm of Hg. A lancet or scalpel blade is used to make a stab wound on the underside of the forearm. An automatic, spring-loaded blade device is most commonly used to make a standard-sized cut. The area stabbed is selected so that no superficial or visible veins are cut. As these veins, because of their size, may have longer bleeding times, especially in people with bleeding defects. The time from when the stab wound is made until all bleeding has stopped is measured and is called the bleeding time. 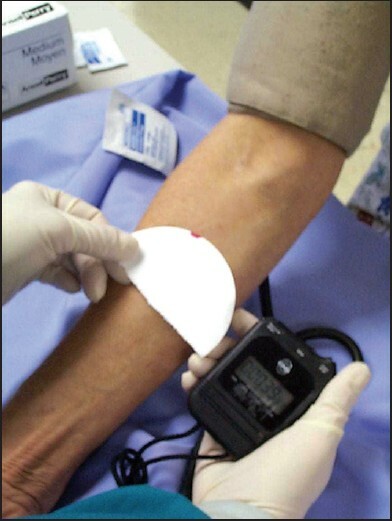 Every 30 seconds, filter paper or a paper towel is used to draw off the blood. The test is finished when bleeding has stopped completely. No two wounds are the same, so the test does not reproduce well. It tests extrinsic and common pathways. INR: It is a mathematical 'correction' of the PT ratio (patient PT/mean normal PT) for differences in the sensitivity of thromboplastin reagents. It relies upon "reference" thromboplastins with known sensitivity to antithrombotic effects of oral anticoagulants (ISI). INR is the PT ratio one would have obtained if the "reference" thromboplastin had been used. It allows for comparison of results between laboratories that is, T ratio) orrection"d as closure timebuilds to a stable platelet plug of the apperture tachments and standardizes reporting of the prothrombin time. Tests the common pathway, thus the ability to form initial clot from fibrinogen. Thromboelastograph is an instrument that measures the development of blood clot viscoelastic strength over time. A rotating piston is suspended in a cuvette filled with heated blood. As clot formation proceeds, the rotation of the piston is affected and characteristic curves are generated [Figure 6]a and b.
TEG provides information about the kinetics, strength and stability of the blood clot. The shape of the graph is determined by the viscoelastic properties of the blood and functional activity of the blood components. Its interpretation requires comprehensive knowledge. K: Time from the beginning of clot formation until the amplitude of TEG reaches 20 mm, representing the dynamics of clot formation. α angle: Angle between the line in the middle of the TEG tracing and the line tangential to the developing body of the tracing, representing the kinetics of fibrin cross linking. MA (maximum amplitude): Reflexes the strength of the clot, which is dependent on the No. and function of platelets and their interaction with fibrin. A60: Measures the rate of amplitude reduction 60 min after MA, representing the stability of the clot. 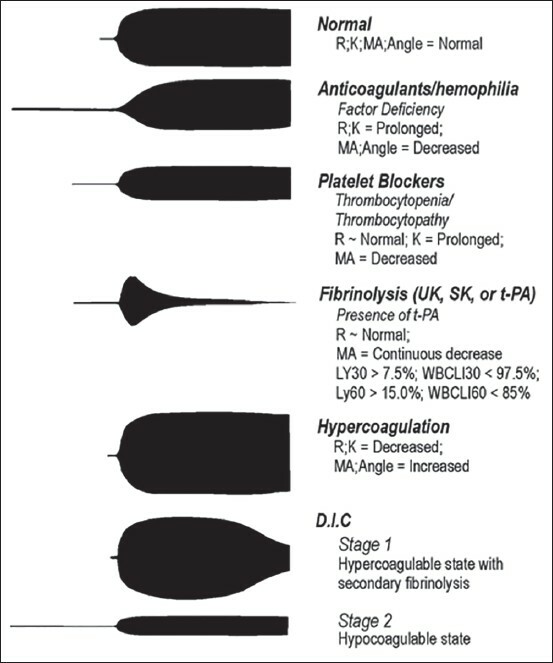 The etiology of the coagulopathy may be obtained by analyzing the thromboelastograms [Figure 8]. Portable systems for rapid measurement of PT and INR [Figure 9] have been specifically designed for healthcare professionals and their patients to enable on-the-spot analysis of coagulation levels (PT/INR) during mobile emergency treatment or for routine follow-up in a hospital ward and/or at their general practice. 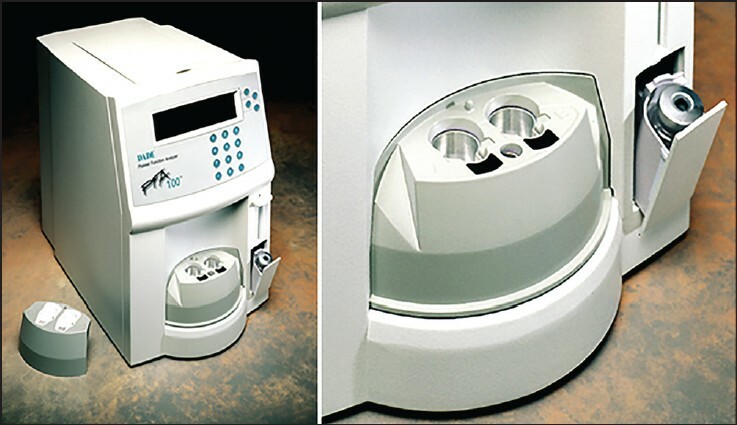 These systems are easy-to-use reflectance photometers, portable and battery-powered devices for rapid measurement of Prothrombin Time (PT) and International Normalized Ratio (INR). It has always been a challenge to health care professionals and to their patients which involves a venous blood sample or the patient themselves being sent to a laboratory. This is time-consuming and patient's compliance can be limited, as it often requires a second appointment with the healthcare professional. These systems provide accurate results from a single drop of capillary blood from the fingertip within one minute improving compliance. 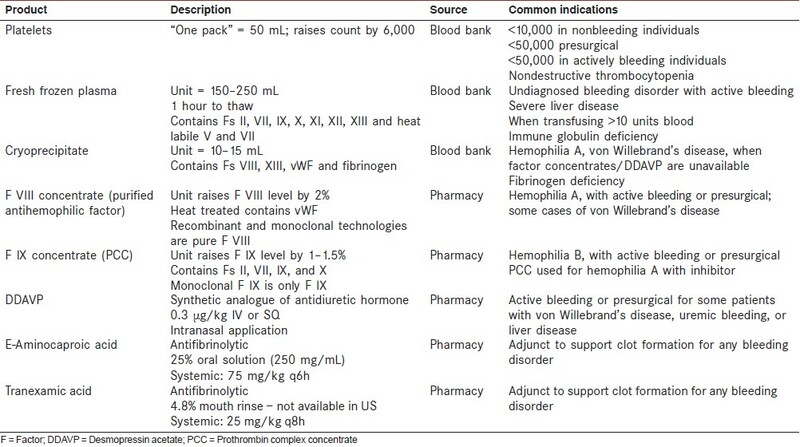 Patients with Bleeding Disorders:  [Table 5]. A number of surgical procedures including those performed in dentistry may cause bleeding. Normally these procedures carry very little risk; however, this is compounded in the presence of bleeding disorders. 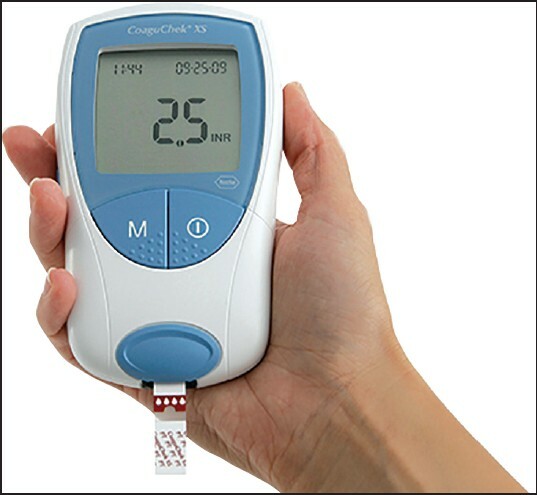 Once the patient with bleeding problem has been identified from history, clinical examination, and laboratory diagnostic tests; steps can be taken, to greatly reduce the risk associated with these procedures. Little JW, Falace DA, Miller CS, Rhodus NL, editors. Dental Management of the Medically Compromised Patient. 8 th ed. ; 2012. Morgan GE Jr, Mikhail MS, Murray MJ, editors: Clinical Anaesthesiology. 5 th ed. Lange; 2013. Minors DS. 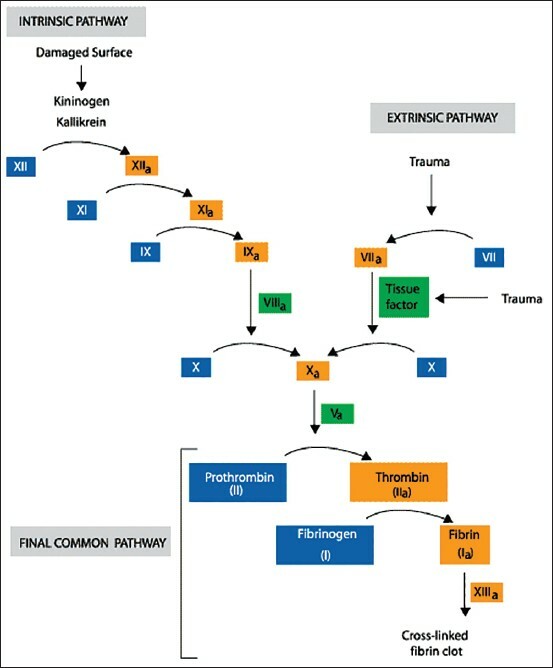 Haemostasis, blood platelets and coagulation. Anaesth Intensive Care Med 2004;1:11-3. Allman KG, Wilson IH, editors. Oxford Handbook of Anaesthesia. 3 rd ed. Oxford: Oxford University Press; 2010. Brown V. Clinical aspects of coagulation. Anaesth Intensive Care Med 2004;1:14-7. Gupta A, Epstein JB, Cabay RJ. Bleeding disorders of importance in dental care and related patient management. J Can Dent Assoc 2007;73:77-83. In: Duke J, editor. Anesthesia Secrets. 4 th ed. Elsevier; 2010. Yao FF, editor. Anaesthseiology Problem-Oriented Patient Management. 7 th ed. Lippincott-Raven; 2011. Greenberg Martin S. Glick Michael: Burket's Oral Medicine. 11 th ed. McGraw-Hill Medical; 2011. Henry RG. Dental management of patients taking antiplatelet medications. Tex Dent J 2009;126:608-16. Oral Medicine and Oral Surgery Francophone Society. Management of patients under anti-platelet agents' treatment in odontostomatology. Verma G. Dental extraction can be performed safely in patients on aspirin therapy: A timely reminder. ISRN Dent 2014;2014:463684. Bertrand ME. When and how to discontinue antiplatelet therapy. Eur Heart J Suppl 2008;10 (Supplement A):A35-41. Aspirin in Patients Undergoing Noncardiac Surgery: POISE-2 clinical trial (Perioperative ischemic evaluation study). Gov number, NCT01082874. Published online on March 31, 2014, at NEJM.org.